Why Should I Go to an Implant Dentist in Ballwin? Our smile is one of the first things people notice and it can say a lot about a person. We try our best to take care of that smile but sometimes life just gets in the way. Oral health problems, trauma, injuries and illnesses all can cause tooth loss. It’s discouraging and can really negatively impact the way we see ourselves. 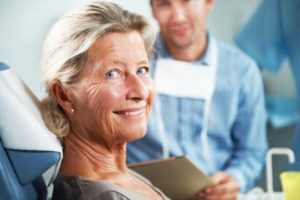 Fortunately we have a team that is here to help and dental implants in Ballwin, MO can be the answer you have been searching for if you have lost one or more of your teeth. Not everybody can perform a successful dental implant procedure or surgery. It is true that it is actually legal for any licensed dentist to put in dental implant; but their experience and skill in placing dental implants matter. Dr. Postol has several years of experience placing dental implants, and can help you get your smile back! When it comes to a successful dental implant, your dentist’s experience matters. Dr. Postol has several years of experience treating patients from all walks of life, with different dental needs. When you’re sitting in his dental chair, you can be sure he will deliver excellent care. When you get dental implants in Ballwin, you can expect Dr. Postol’s experience to help you get the smile you want. Dr. Postol, our implant dentist in Ballwin, MO, is experienced and always puts his patients first. He works closely with his team to bring you the most comfortable experience as possible. He is a member of several dental associations and is continually learning and striving to better his skills. You can trust and have confidence in our service of dental implants in Ballwin, MO. Our dentists and staff will work hard to make your experience an excellent one! You can feel good in knowing that you are with a team who cares about you and your experience and results. Our Ballwin Implant Dentist has the training and background you are looking for. Contact our office today!